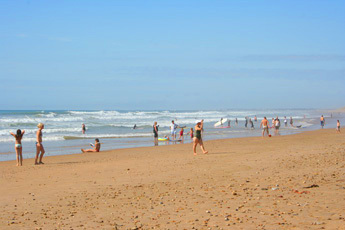 A favourite with surfers, this beach is a Mecca for locals and holidaymakers alike principally as it is the only beach between l'Aubraie and Des Granges. There is also a road through the Forest of Olonne and decent parking. The car park has two exits to the beach. 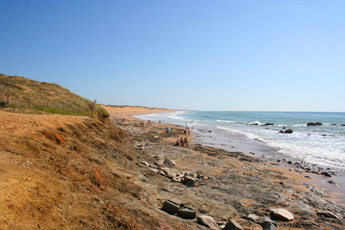 The southern exit comes out onto a rocky outcrop, and these outcrops continue for some distance before the wide open sands re-assert themselves, even so amongst the rocks there are many sandy areas. The second exit opens up onto a wide expanse of fine sand and during the season there is surveillance and some facilities. The north end of the beach toward the Grande point, and Menhir beach are used by Naturists these beaches can also be reached by walking through the pine forest, although it is about 1 kilometre from the small car parks on the D80 Olonne-sur-Mer to Brem-sur-Mer road.